The Bristol Blenheim takes to the skies. Image copyright IWM. 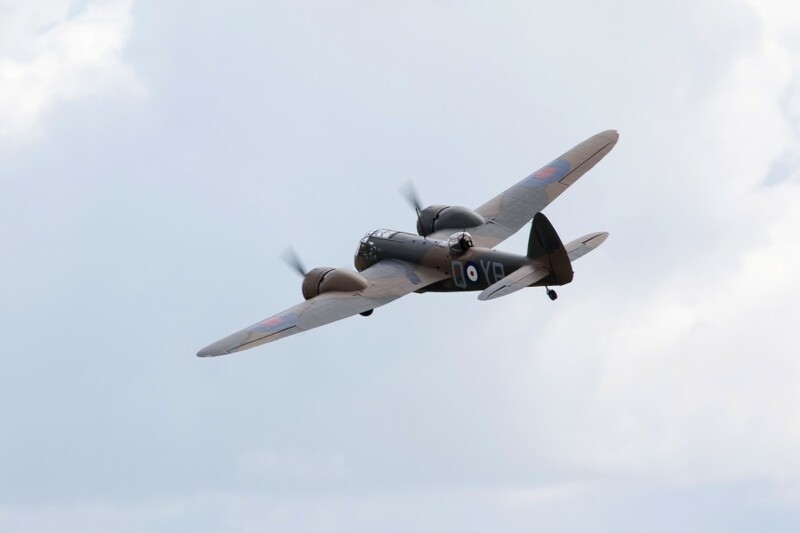 Today (Wednesday 20 May) Aircraft Restoration Company’s Bristol Blenheim G-BPIV took to the skies in preparation for the VE Day Anniversary Air Show at IWM Duxford this weekend (Saturday 23 and Sunday 24 May). 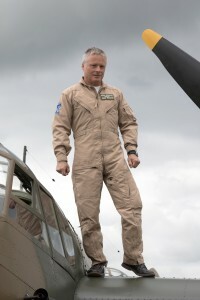 pilot John Romain, owner of the Aircraft Restoration Company, climbs out of the Bristol Blenheim. Image copyright IWM. John Romain, pilot of the Bristol Blenheim and owner of the Aircraft Restoration Company, and Squadron Leader Ian Blair (RAF retired) discuss flying the Blenheim. Image copyright IWM. Following a 12 year restoration, the Blenheim will have its first flying display at the VE Day Anniversary Air Show this weekend. John Romain, owner of the Aircraft Restoration Company, flew a spirited display in the Blenheim, before landing and taxiing the aircraft next to IWM Duxford’s historic Control Tower. Also in attendance was Squadron Leader Ian Blair (RAF retired) who was an armourer on Blenheim Mark Is during the Second World War. On one mission, Ian was forced to take control and fly a Blenheim aircraft after his pilot was killed following an attack by an Italian Fiat CR42. He not only managed to evade the enemy aircraft, but flew the Blenheim 350 miles back to his base where he made a successful textbook landing. This extraordinary action earned him the award of an immediate Distinguished Flying Medal. He trained as a pilot and was awarded his wings in May 1941. He flew Spitfires for the remainder of the Second World War. 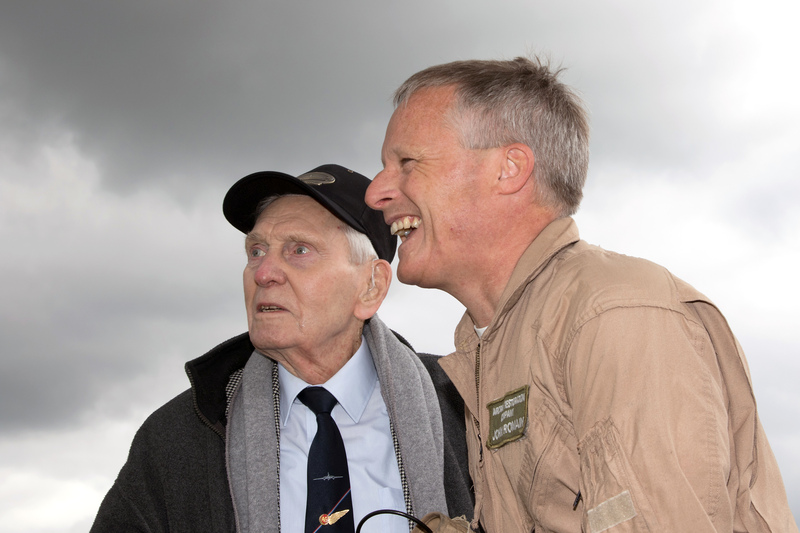 The VE Day Anniversary Air Show (Saturday 23 and Sunday 24 May) pays tribute to the men, women and children who endured six years of conflict on the fighting fronts and the Home Front of the Second World War. The flying display shows how the Second World War was won in the air. Accompanied by music, speeches and audio recordings of veterans’ memories, flying aircraft show Britain preparing for war, the vital victory in the Battle of Britain, the bombing campaign, flying with the armies and the navies, and why Victory in Europe didn’t end the Second World War. 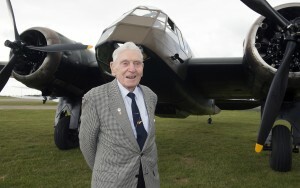 Squadron Leader Ian Blair (RAF retired) in front of the Bristol Blenheim. In a poignant spectacle commemorating the 70th anniversary of VE Day and its own 70th anniversary, B-17 Flying Fortress Sally B will lead a VE Day anniversary salute of seven Second World War bombers and fighter aircraft. Living history groups give a glimpse into life on the Home Front, including wartime weddings, the Home Guard, the Women’s Auxiliary Air Force and the United States Army Air Forces. Experience the era when ‘Beauty was Duty’ with 1940s hair and make-up demonstrations.